If a person irritates you, again and again, you will try to get rid of him. Same rule follows in email marketing world..!! If you send an email to your customers frequently – you will be marked as spam. Don’t worry, using Unsubscribe email feature of MailGet – your customers can easily unsubscribe you with a single click instead of marking as spam. Bam! Get reduced spam complaints. What Is Unsubscribe Email Link? A link that customers click on, to effortlessly remove themselves from your email marketing list. Then, he/she can unsubscribe it by clicking on unsubscribe email link provided in an email, and hence customer will not receive any mail in future. Unsubscription link is included at the bottom of the email, to give ease to the users if they would like to unsubscribe from your newsletters. Why Should You Include Unsubscribe Email Link? 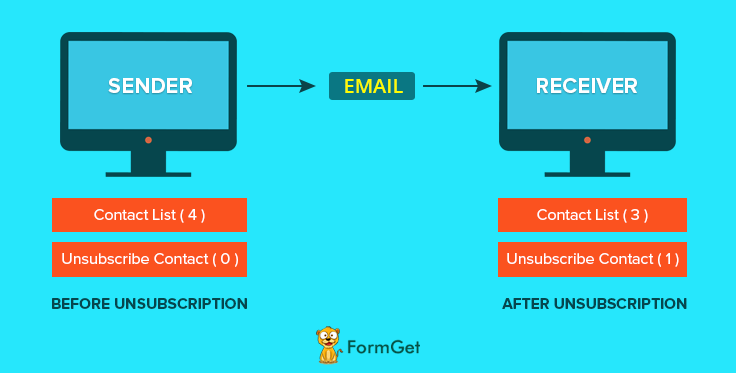 Adding an unsubscribe link will make a big difference in how your recipients perceive the messages you sent. Most providers like Hotmail, Gmail, and Yahoo! support email list unsubscribe functionality. It works as an alternative to the report spam link and viewed positively by most ISPs and spam filters. You get reduced complaints -> improves email delivery rates. How To Handle Unsubscription Email Link? Keep your email opt-out link simple and smart. Don’t try to confuse your subscriber, use appropriate labels and proper text to make it easily understandable by your customers. Instead of writing the text like “opt-out link for email”, use the relevant text on a link says “Unsubscribe here”. If your subscribers don’t find the unsubscribe link in email, they can mark you as spam. Ensure that the unsubscribe email link in your message is not hidden. This makes a big difference in your brand reputation. When people want to unsubscribe, they expect the process to be easy and fast. Avoid your user getting more frustrated by making it happen quickly and instantly. Make it done with a single click. Guess What! MailGet Does All This For You.. When your clients easily found an unsubscription link in your emails, then instead of marking you as spam they change their mind and unsubscribe you. Providing a link of unsubscription in your campaign helps to build trust and brand reputation among customers. Let your customers go if they wish to..
Give them a freedom and ease to unsubscribe from your list and do not force them to keep connected with you. In this way, MailGet lets you manage email unsubscription process automatically.